If you want to get the best tactical scope you’ll have to spend a generous amount of money, so you’ll need to be particularly careful about your investment. 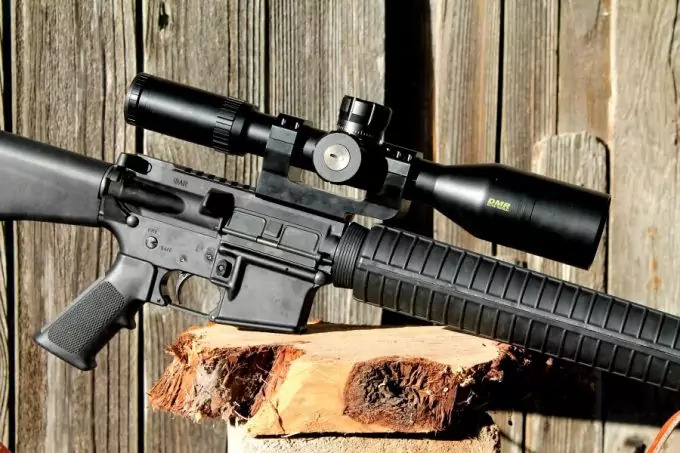 Sometimes you’ll find a tactical scope at $300 or below, but that’s more likely a scam. So we’re here to help you avoid those situations, as well as to help you choose the proper scope for your exact purposes. We’ll start with some factors you need to consider before making your purchase, then review some of the top notch items on the market. All that is summarized in the table below. The magnification range and diameter will tell you a lot about how you’ll be able to use the scope. A wide range of magnifications means you get a versatile item for enhanced details as well as accurate depth perception. It also means you’ll be able to use the scope for targets of various sizes and at different ranges. The scope diameter accounts for light transmission. A bigger diameter lets more light pass through the lens, thus making the image brighter and clearer even in a dim light surrounding. 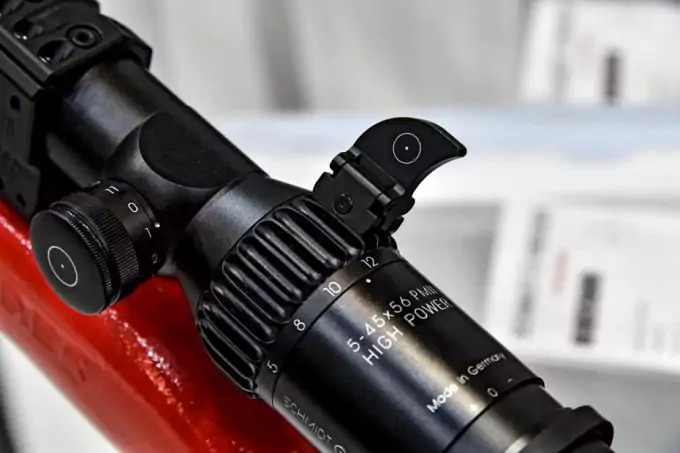 So if you’re planning to use this scope in various light conditions, at different distances, and for different games, choose one with a big diameter and a wide magnification range. You’ll want an extremely precise reticle if you’re looking for a tactical scope. For instance, a crosshair reticle is pretty basic, but it’s great for precision shots. There are even more precise reticles out there, though which allow holdovers as well as fast target acquisition. You’ll also have to choose between first focal plane and second focal plane reticles. In the first case, the reticle size changes when you zoom, so they’re more appropriate for tactical or long range shooting. The second focal plane reticles are good for tactical purposes too, though they work for the close to middle ranges. 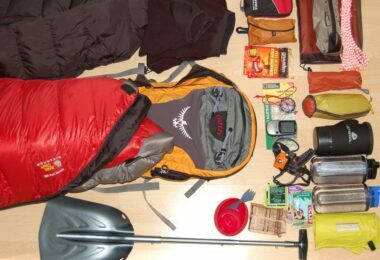 You’ll need a reliable product, particularly if you’re to invest so much money. So look for products made from aluminum or steel. 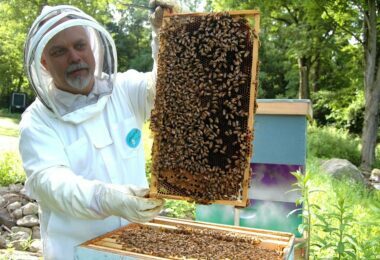 These are the most resistant on the market, though the steel devices will be heavier. You should also make sure your product is water resistant and fog proof so you get clear images regardless of the weather. 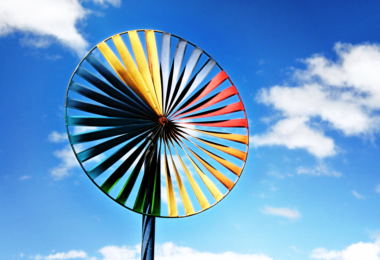 A nitrogen or argon purging is great for ensuring these characteristics. And to ensure you get bright images, check that you have a quality multi coating, though that will add to the weight as well. Checking which sort of mount is included, if any, will save you a lot of troubles later. You should also ensure that the scope can be mounted successfully on your rifle. So double checking the compatibility between the built-in or necessary mounting system and the one your rifle has is essential. 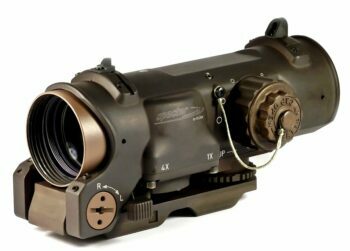 However, most tactical scopes have a good compatibility to Picatinny rails since they have 30mm or 34mm tubes. This is another thing you should look after especially if you know there’ll be long hours on the field. Check if there are any batteries included in the package so you can purchase your own if there aren’t any. Also, some of the best scopes have an illuminated reticle that doesn’t require any batteries to work, so that’s a plus. With that in mind, let’s take a look at the products below so you can evaluate them depending on the factors we’ve just discussed. You’ll know you’ve got the perfect scope not when you buy the most expensive one, but when you find one that suits your needs. That’s why we’ve listed both the pros and the cons for each scope, so you can make the best decision. 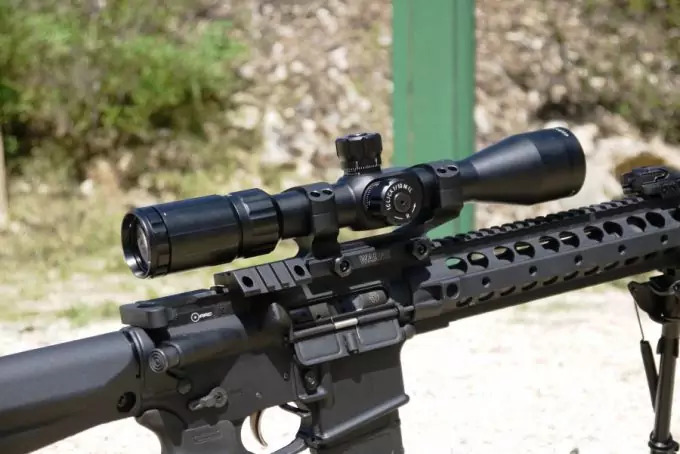 The Trijicon ACOG BAC Riflescopes is definitely a product that’s worth its expensive retail price. 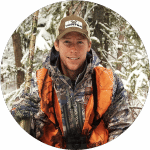 The 4x magnification makes it great for hunting deer, and the 32 mm diameter is amazing for low light conditions, though you can use this scope at night time too. The reticle is one of its main pluses thanks to the dual illumination technology used. The tritium means the reticle will always be lit even without batteries, while the fiber optic adjusts the intensity. So not only can you use this scope in all possible lightings, you can also keep both eyes open. 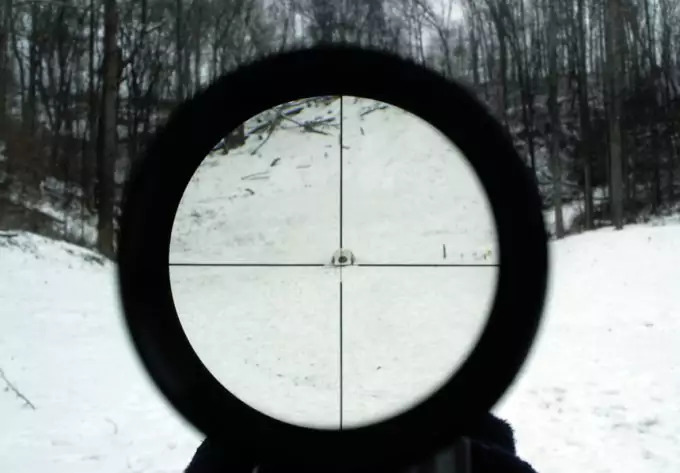 The horseshoe type of reticle is another thing we love because it can be used from close range to 800 meters. So you’ll get quick target acquisition for the close range and the Bullet Drop Compensator for further distances. However, the right hand side of the reticle appears blurry, but the official FAQ page says it’s normal because of the prism design that distorts the light. We love that the windage and elevation are automatic, as well as how resistant this scope is. Its sturdy 7075-T6 aircraft aluminum alloy body is waterproof to 11 m, so that’s another upside. The US Optics ER-25 Riflescope is a really expensive rifle scope, but again, you pay for an incredible quality. Take the Erector Repositioning Elevation Knob, for instance. This EREK technology is patented and allows 110 clicks of adjustment for each revolution, so you can rely on its accuracy. The MOA reticle is very precise too with all its detailed subtensions. Besides, it’s a red reticle that features 12 different brightness levels so you can adjust it accordingly for different lights. The front focal plane design is great for holdovers and ranging, and you’ll get the best image clarity thanks to a 58 mm lens diameter. 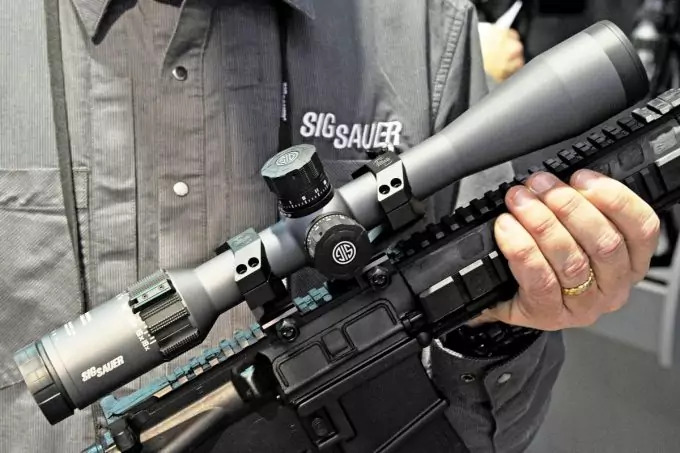 The 5-25x range of magnification renders this scope very accurate at different distances, with increased details for versatile hunting and shooting even beyond 2,000 yards. Plus, the 34 mm tube is a type III, manufactured from a resistant anodized aluminum. The only downside, apart from its huge price, is the weight that can destabilize your weapon if you’re not used to shooting. Related: If the price is a bit more than you can afford, but you love the wide range of magnifications offered, you can always consider the Nightforce Optics NXS Riflescope that has a 5.5-22×56 lens, and a 30 mm tube that’s also great for versatile hunting. 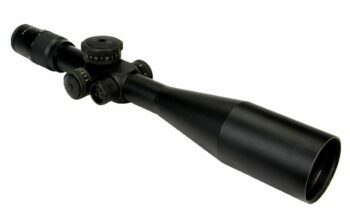 The Elcan Specterdr Riflescope is a resistant scope, manufactured from a hard anodized aluminum. The 1/4x makes it better for close range hunting or going after bigger game, but the 1x isn’t truly no magnification, so you can’t use an iron co-witness. However, it allows a very precise target acquisition when shooting with both eyes open. The crosshair reticle is precise, and we love the VSOR rangefinder. You’ll find that this scope holds zero very well even after several dismounts. The resolution is great, and the rendered images are crisp. The 3000 hours average battery life is another asset, but you won’t get one included. Another disadvantage is that this scope only works with Mil-Std-1913 Picatinny rails, so it’s not that versatile. Related: Although the battery life for this scope is pretty long, you can always make sure you have enough batteries. Besides, there’s no battery included either, so get the Duracell Lithium Battery, which bears the Duracell seal of trust. The Leupold Mark 4 MR/T Riflescope is a less expensive rifle scope, but it still does a terrific job. The 2.5-8x magnification renders it great for tactical purposes at a medium distance, but the 36 mm lens diameter offers clear images in all light conditions. The 30 mm tube is clear and bright, while its matte black finish renders it resistant to scratches. We love the illuminated TMR reticle that’s very precise, but the additional windage and elevation adjustments aren’t automatic. However, the 1/2 MOA adjustment knobs have audible clicks, so you can have better success with the adjustments. The fast focus eyepiece is another plus in terms of fast target acquisition, which is why this is such a great tactical scope. 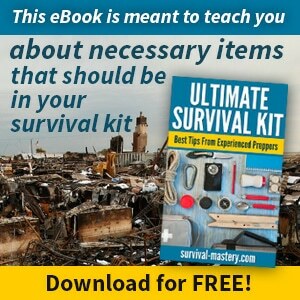 Otherwise, you can only use it with AR15 or M16 rifles, so it’s not that versatile. Related: You will need a mount for this scope because it doesn’t have an incorporated one. And the Leupold Mark 2 IMS fits the bill perfectly, considering it’s made by the same brand. You’ll get a sturdy, yet light anodized aluminum mount, that fits Picatinny rails, offering optimal height for the Leupold Mark 4. 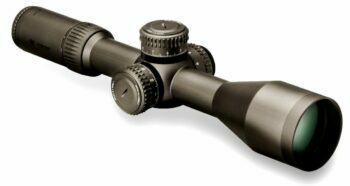 The Vortex Razor Riflescope is a qualitative scope that works for shooting different targets at various distances. In fact, if you have a good enough rifle, you can shoot even beyond 1,500 yards. That’s thanks to the adjustable magnification that covers a range between 4.5 and 27x so you can see very enhanced details. The 56 mm lens diameter is awesome for low light circumstances thanks to an increased light transmission. The XR full multi coating helps in that regard too, rendering extremely bright images. However, that along with the solid aircraft grade aluminum build give a particularly heavy scope. 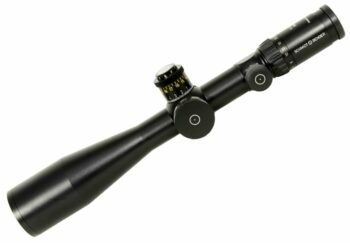 The glass etched EBR-2C MRAD reticle is durable, reliable and great for accurate holdovers and ranging at different magnifications. Besides, it’s illuminated to it’s great even in dim light. The 34mm tube is clear, and we love the fast focus eyepiece. Unfortunately, there are no lens caps included. The windage and elevation settings are manual, although the turret positioning is high so it won’t get in your way. Related: You can always get the Vortex Defender Flip Cap Objective Lens if you want extra protection for the lens of your scope against dust and debris. This is a flip cap so it’s easy to adjust and take off depending on your needs. The Schmidt Bender PMII Riflescope is another great item for versatile shooting considering the wide 5-25x range of magnification. The 56 mm lens is great for dim light conditions, particularly because they offer a 90% light transmission. That renders very clear images so you’ll have an optimal resolution. Even the side focus parallax of 10 m to infinity guarantees you’ll see crisp images with no blur or halo effect from 10m onward. The Horus H59 reticle is illuminated, which is another asset for dark environments. Besides, this is a first focal plane type of reticle, and that equals increased precision. The 34mm tube is very qualitative, and resistant to impacts and scratches thanks to its matte black finish. Unfortunately, it weighs quite a lot and the 3.5 inches eye relief could be better in terms of comfort. Otherwise, we appreciate the very precise 1 mRad CCW adjustments for windage and elevation so you can take accurate shots regardless of wind or angle. Related: If you’re after increased precision and love the Schmidt Bender brand, you can also consider the Schmidt Bender Limited Edition Riflescope. Thanks to a 5-25x magnification and an illuminated Tremor 2 reticle, you’ll be able to get precise and fast target acquisition at different ranges. The Bushnell Tactical Rifle Scope is a great scope for tactical purposes, especially considering the reduced price compared to the other scopes we’ve reviewed here. The 4.5-30x magnification range would be great for all sorts of distances, rendering very enhanced details, but the field of view is narrow. The Mil Dot reticle is a basic model but still does a good job, though other more expensive items have more accurate reticles. The target turrets are great for their purpose, but we really love the blacked out finish for optimal concealment. The Ultra Wide Band coating and the full multi coating for the lenses explain why you get such bright images. The 30mm tube has a RainGuard HD anti fog coating, so you’ll get a waterproof and fog proof scope. That’s also thanks to the argon purging. And the 3 inch sunshade is great for very bright light. 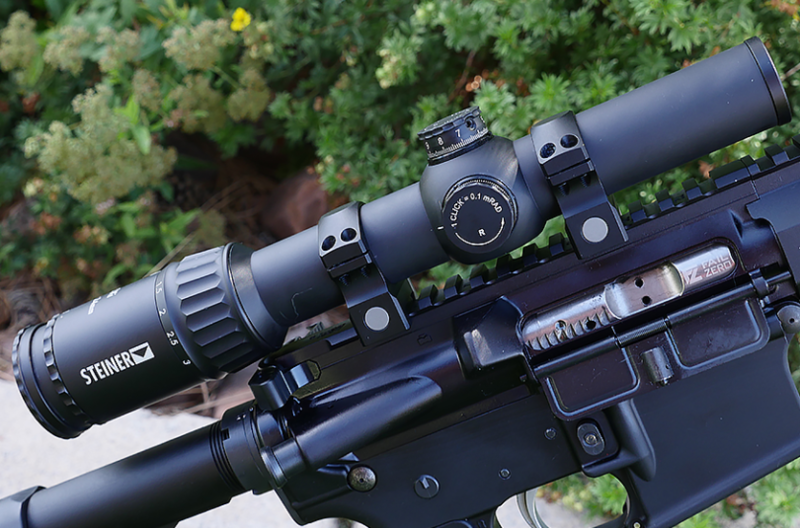 Related: The Nightforce Optics Alloy Ring Set is exactly what you need to mount this scope on your rifle. 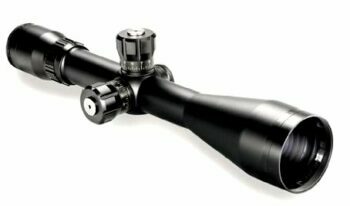 They accommodate any 30 mm tube, which is why we recommend them for the Bushnell scope. 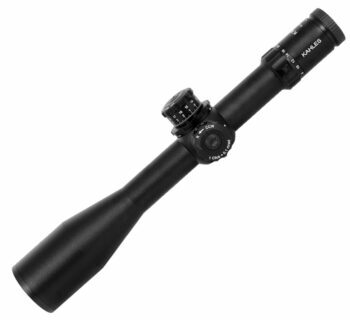 The Kahles K624i Riflescope is great for very clear images. We love the 34 mm qualitative tube and the illuminated first focal plane reticle which renders fast target acquisition and enables holdovers at all the magnifications. 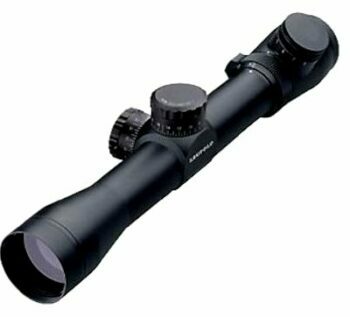 In fact, the 6-24x magnification range is more than satisfactory for obtaining detailed images. The 56mm lens diameter along with the 95% light transmission explains why you’ll get such bright images. The machined hardened steel body is very sturdy and resistant to most on field impacts and damages. However, since steel is a heavy material, the overall weight of this scope is heavy too. We also love the 0.1 Mil adjustments for the windage and elevation because of their increased precision. On the other hand, the 3.54 mm eye relief is a bit small for our taste, though it’s not the smallest on the market. Related: If you’re interested in a very qualitative tactical scope with a second focal plane reticle, the NightForce ATACR does a wonderful job for mid range too. With 4-16×50 mm lens and a waterproof and fog proof body, you can use this scope in different light conditions, weather and terrain. Whether you’re more interested in getting the most qualitative glass on the market as is the case with the Leupold Mark 4 MR/T or you want an incredibly accurate reticle like that of the Vortex Razor HD Gen II Riflescope, you’ve come to the right place. We’ve covered a wide pool price, showing you extremely qualitative items that fit a vast range of purposes. That said, which scope got your eyes and your heart? What will you be using it for? What other scopes did you get so far? Tell us all in a comment below!